The neonatal intensive care unit at Rady Children’s Hospital in San Diego. April 12, 2017. Megan Wood, inewsource. Ever so quietly, a California health agency recently uploaded an alarming chart on its website. The graphic shows an especially steep rise in the number of newborns affected by drugs transmitted from their mothers during pregnancy or through breast milk starting in 2008, when the number statewide was 1,862. By 2014, the number rose to 3,007. But the biggest yearly jump came in 2015, when the number of affected babies hit 3,633, a 21 percent climb. That’s despite a steady decline in the number of births in California since 2008. In San Diego County, that 2014-15 trajectory has been even more dramatic, according to county birth data prepared at inewsource’s request by the Office of Statewide Health Planning and Development, or OSHPD, the agency that collects patient discharge data from hospitals. The county had 182 cases in 2014 but 289 in 2015 — a 59 percent jump. That didn’t include babies affected who were not born in hospitals. 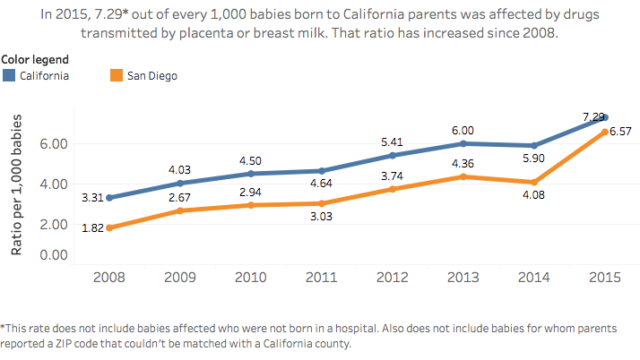 That’s a rate of 6.57 per 1,000 births in San Diego County, compared with 4.08 in 2014 and 1.82 in 2008. In 2015, the statewide average was 7.29, up from 5.9 in 2014. State and county health officials couldn’t say what is behind the spike other than more pregnant women are using addictive drugs. But other possible explanations include clinical policy changes that promote more aggressive infant and mother screening, expanded definitions of populations at high risk, and a new national diagnostic coding system that took effect Oct. 1, 2015. Neonatal experts say babies are screened for drugs when the mother or family member acknowledged that she used — or is known to have used — narcotics, cocaine, hallucinogens or another addictive drug during pregnancy, or when babies exhibit signs of withdrawal within the first 48 hours after birth. In the medical world, these symptoms are called neonatal abstinence syndrome or NAS. “The baby might be sneezing, jittery, or irritable and not be able to be consoled, or they might have diarrhea or a lot of other relatively subtle signs that nurses are trained to look for,” said Dr. Lawrence (Lance) Prince, chief of UCSD’s and Rady Children’s Hospital’s division of neonatology. His division runs neonatal intensive care units that treat these babies at nine area hospitals, including four Scripps Health facilities, Palomar Medical Center and Pomerado Hospital, and Rancho Springs Medical Center in Murrieta. The infants might also exhibit tremors or seizures, elevated heart and respiratory rate, or be difficult to feed, he said. Between 55 percent and 94 percent of babies born to mothers who used opioids while pregnant will suffer symptoms of drug withdrawal. a history of Child Protective Services involvement or a child in foster care. 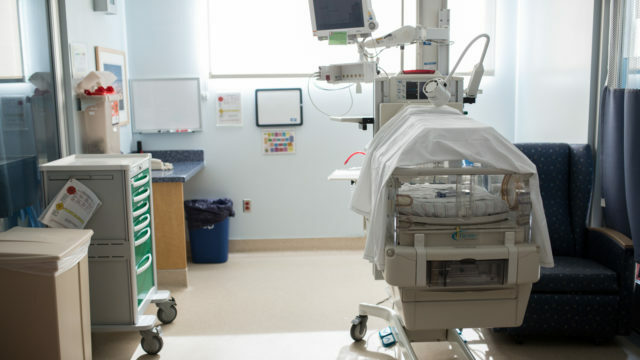 Dr. David Golembeski, neonatal services medical director at Palomar Medical Center, said his hospital has a “low threshold” for sending a baby’s urine or stool for toxicology testing, and some obstetrician groups are testing all pregnant women. Clinicians use a scoring system to gauge withdrawal severity, and when babies reach a certain number, treatment for withdrawal begins. A look at affected baby counts by quarter produces a clue. In counties with the largest number of affected infants, NAS cases rose disproportionately in the last quarter of 2015, which started Oct. 1, compared with the previous three. Oct. 1, 2015, was when the nation converted its diagnostic coding from a system known as ICD-9 to the much more specific ICD-10. Perhaps the more explicit codes captured more categories of babies born to mothers on drugs. OSHPD spokesman David Byrnes said the agency highlighted the newborn data as one of two “DataBytes” it features each month for its “topical interest,” but did not analyze the numbers as to a cause for the greater rate of increase. Officials with the California Perinatal Quality Care Collaborative and the California Maternal Quality Care Collaborative also could not explain the steep rise. Nor could the California Department of Public Health, which pointed to a general “rise in the number and amount of prescription medications being prescribed and dispensed,” many of which are for opioid pharmaceuticals with the potential for abuse, and a “sharp rise” in heroin use since 2010. The department has launched several programs to prevent prescription drug overdoses and misuse. No matter why the uptick in the last quarter of 2015, the consequences are real to families and taxpayers because most of these babies’ medical expenses are paid by Medicaid, or Medi-Cal as it’s known in California, using a combination of state and federal funds. According to the National Institute on Drug Abuse, a baby suffering from withdrawal will likely endure “lengthy and costly hospital stays,” with an average of 17 days and a cost of $66,700, compared to 2.1 days and $3,500 for an unaffected baby. The long-term outcomes for a newborn are less clear, but may include low birth weight, preterm delivery, smaller head circumference or visual disturbances. “The thing we don’t really know yet is what (exposure to addictive drugs) does to babies long term,” Prince said. Fears about negative impacts on babies whose mothers used crack cocaine or methamphetamine turned out to be ill-founded, he said. “But with opioids it’s probably going to be different, because we know babies exposed to long-term opioids — it does affect brain development, although the consequences of that we don’t yet know.